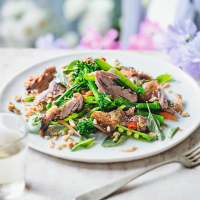 An Asian twist on a steak salad, using classic British springtime ingredients. 1. In a large bowl, mix together the garlic, mirin and soy and fish sauces. Toss the steaks in the mixture and season with pepper, then set aside to marinate for 10 minutes. Meanwhile, blanch the asparagus in a large pan of boiling water for 1 minute. Drain and refresh under cold water. 2. Heat a heavy-based frying pan over a high heat. Remove the steak from the marinade, brush off the excess, and cook for 31⁄2 minutes on each side; set aside to rest. 3. Reduce the heat, add the butter and chilli and cook until slightly softened. Pour in the reserved marinade and cook for 1 minute to thicken slightly. 4 Cut the steaks into thick slices and add any resting juices to the sauce. Pile the watercress and asparagus onto plates, top with the steak and spoon over the sauce. Serve with sticky rice, if liked.